Retail group WH Smith has said it is to separate its retail business from its news distribution arm. The news came as WH Smith reported a 3% fall in like-for-like sales to £1.3bn ($2.3bn) in the six months to March. Despite the fall, cost controls and a focus on more profitable sales meant half-year profits before tax and exceptional items rose 4% to £71m. Investors welcomed the news of WH Smith's planned split, and shares in the company rose by 5%. WH Smith said the demerger would create two "distinct businesses" able to pursue their own strategies. "An independent news distribution business will be more responsive to publisher needs and will be able to work more effectively with other retailers, because it will be free of the link to a key competitor," said WH Smith chief executive Kate Swann. The company said the separation was likely to be through a demerger of the retail business, although it said no timetable had been set for the split. Analysts said the split could create extra value for the group, and there was also talk that the distribution arm could become a bid target. 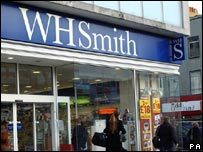 WH Smith considered a sale of the distribution business in 2001. "The positive share price reaction is a result of investor perception that the sum of the parts is worth more than the current combined businesses," said Keith Bowman, equity analyst at Hargreaves Lansdown Stockbrokers. The fall in underlying sales comes after the group reported a similar trend over Christmas, with sales down but profits meeting expectations. "We have maintained our focus on group profitability," said chief executive Kate Swann. She said the results came in the face of a "challenging" High Street environment, where it saw its retail sales fall by 6%. "Overall, we continue to be cautious about consumer spending," said Ms Swann. "However, we remain confident in the outcome for the full year." In the six weeks to 8 April, retail like-for-like sales were also down by 3%.